Maybe you remember this cardigan from my Primark haul? I wore it a lot since I have bought it but never showed it to you in an outfit post so far. These pics were taken last week before meeting up with a friend to have dinner and play bowling. After choosing all the clothes I wanted to wear together I saw that the outfit turned out to be a nice mixture of classy elements (like the LBD, the earrings and the decent colours) and cosy elements (like the oversize cardigan and the ballet flats). What do you think about the combination? How do you like to combine cosy cardigans? This cardi looks incredibly cosy! I would like to have one like that as well. It's perfect for all seasons. Your cardi is so charming and looks wodnerfully cosy, the perfect winter cover up. it's an awesome combination. your sweater looks so soft and cozy! i love sweaters like that. also love the hue of your tights. tip top from head to toe carmen. Ich trage diesen Cardigan auch super gerne, ich habe ihn in einer dunkleren Farbe! I don't have cardigans :( But I love the greyscale theme of this outfit! And the necklace is SUCH a nice touch! Definitely cozy meets classy! I love the oversized cardigan worn over your cute dress! You look wonderful and those flats are super cute! you look so cute in these photos.your cardigan is very versatile!! 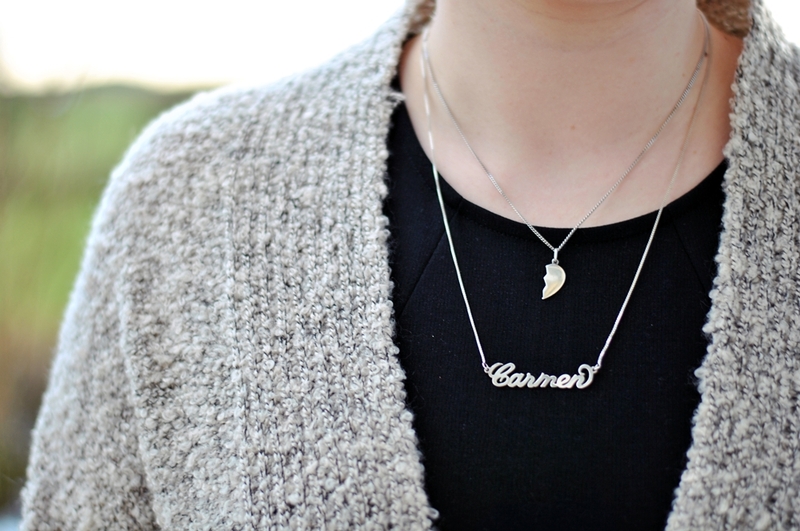 Cute necklaces and the cardigan looks so cosy! I love wearing cosy cardis with dresses just like how you have done in this post! Those ballet flats look so soft and comfortable! H&M is so awesome! Toller Look sieht so kuschlig und gemütlich aus! Ich liebe so Oversize Cardigans könnte ich im Winter immer tragen! Mag Deine Kombi zum schwarzen Kleid! P.S. Bei mir gibt es gerade ein Gewinnspiel! Würde mich freuen wenn Du vorbeischaust!